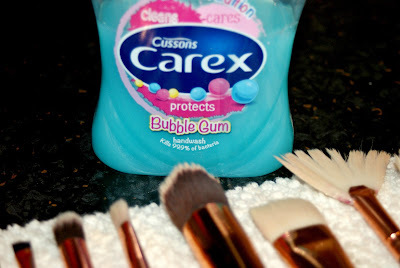 For today's post I'm going to share with you guys how I clean my makeup brushes. Unfortunately I'm the type of girl who loves doing their makeup but hates cleaning my brushes. So this usually ends up in me putting it off for as long as possible and finding out mid makeup I have no eye shadow brushes left that aren't caked in leftover shadow. However, it is soo important to ensure you do clean your brushes regularly as they hold so much dirt and bacteria (Let’s be honest you do not want to be spreading that around your face). 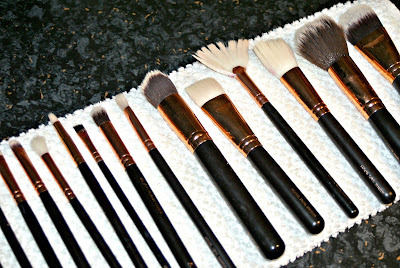 Therefore I am all for making cleaning my brushes as easy and as simple as possible. 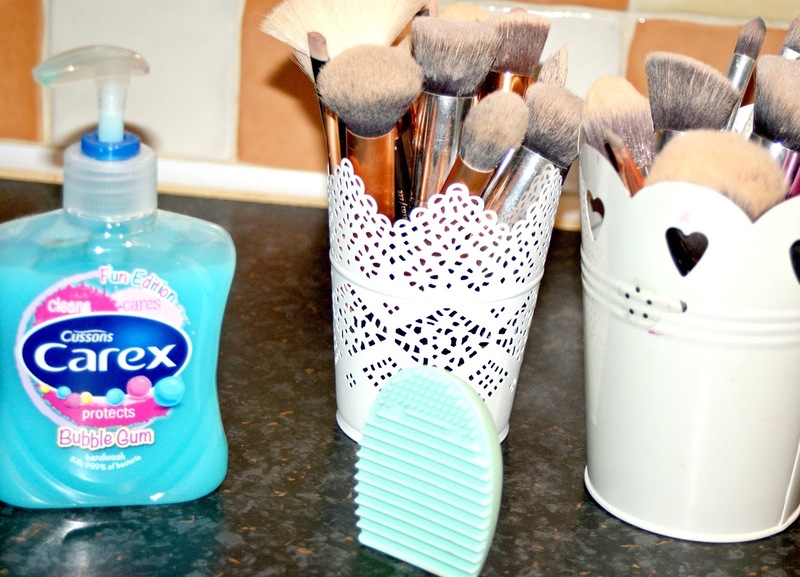 I only use two products when cleaning my makeup brushes as I love to keep things simple. My go to product I use when cleaning my brushes is an anti-bacterial hand wash. Now I know what you’re thinking why a hand wash? 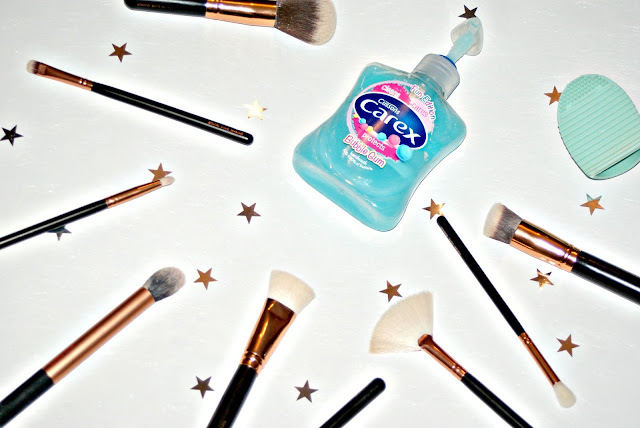 They actually work so well at getting the dirt and excess product out of the brushes as they are obviously designed to clean, but also they have antibacterial properties which is great to wash brushes as this means it will kill any bacteria so you won’t be putting it on your face. The one I love to use is this Carex Bubblegum hand was as it leaves my brushes smelling amazing as well as being antibacterial. 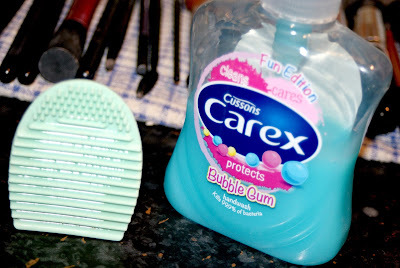 The second product I use is a little silicone brush cleansing tool which you can pop on your fingers and rub your brushes against it and it helps to loosen any product in your brush which makes cleaning them way easier. I also love the fact that this is made out of silicone as it is super easy to clean and it doesn't hold dirt and germs. 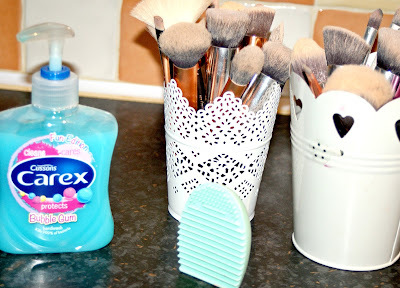 So that's how I clean my makeup brushes a few additional tips would be to make so you wash them at a time when you don't need them as they can take 1-2 days to completely dry depending on the density of the brush, try to avoid using a hairdryer as this can dry them out and cause them to lose their shape and I personally prefer to avoid conditioning my brushes as I find that they feel amazing but they tend to pick up less product as they are so silky.